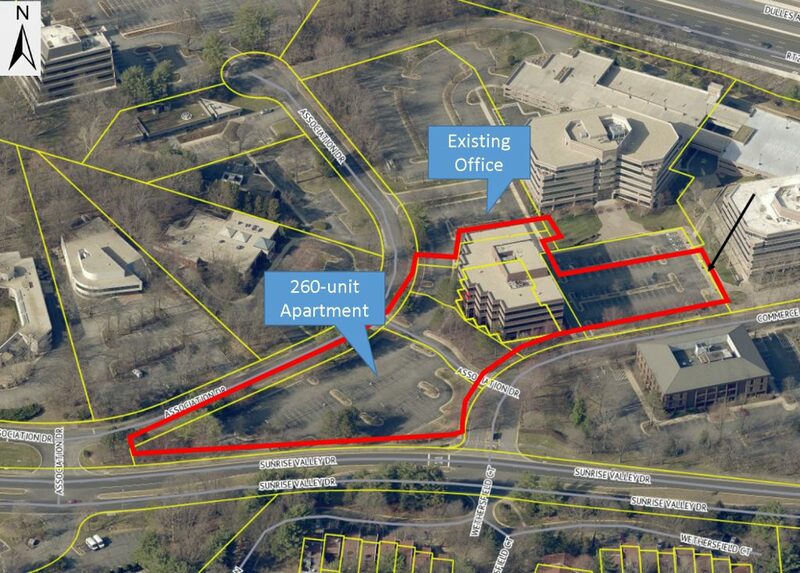 The Fairfax County Board of Supervisors this week approved plans for a new 260-unit apartment complex near the Wiehle-Reston East Metro Station. The seven-story apartment complex, dubbed “the Lincoln,” will be located next to the site of the future Metro Commerce Center, a multi-acre development by Vornado Realty planned to consist of four towers featuring offices, residences, retail and a hotel. The Lincoln is slated to be built on three acres near the corner of Sunrise Valley Drive and Commerce Park Drive, where a surface-level parking garage for the Executive II office building is located now. The firm developing the Lincoln, Wiehle Station Ventures LLC, told the board that the apartment complex will feature an interior courtyard and underground parking. “The developer will also help to build the planned shared-use path along Sunrise Valley,” the board said in its announcement Thursday. The site for the Lincoln complex is close to Reston National Golf Course and Soapstone Drive, where a future toll road crossing is planned. In The Design Studio: Light it Up!